Published: . Filed Under: HerStories, Modern Parenthood. I nearly forgot that I had my own blog. To me, pregnancy feels like a long, solo journey to a strange, distant land. I turn inward. I slow down. I retreat. I wait. I process. As I enter the last days of my pregnancy, I know that I’m on two very different sort of journeys: one of entering a new phase of middle adulthood and my forties and another of adding a new daughter to our family. 39 weeks pregnant, 2011: Tired and just done. Being 39 weeks pregnant feels so much like being 39 years old to me. You’re on the edge of a new path, a new direction. You feel very much like your old self, but know that new versions of yourself are about to be born. Being 39 weeks pregnant is a time of uncertainty. Your life might change at any hour… Or it may stay the same for weeks. Both states — change and stasis — terrify you. Being 39 weeks pregnant is about managing discomfort. Even if you’ve had an easy pregnancy so far with no complications — as I have — there’s no getting around the fact that your last days of pregnancy will make you feel large and plagued with annoying physical ailments, from constant cramping to the need to pee more than five times per hour. Being 39 weeks pregnant is about knowing — and being told again and again — that you need rest to prepare yourself for what’s to come, but finding restorative, fitful rest elusive. Despite my pregnancy pillow, early bedtime, and exhaustion, the quality of my sleep has deteriorated beyond recognition. I toss. I turn. I jump up out of bed with leg cramps. I waddle to the bathroom. I throw my pillows to the floor in frustration. Being 39 weeks pregnant, with a first-born child in the house, is about looking forward to spending many weeks consumed with getting to know, learning to love, and focusing intensely on your new baby. And then feeling anticipatory guilt about neglecting and confusing your older child. You wonder if your heart is big enough, and if you will have enough energy, to love two small children completely, passionately, and patiently. Being 39 weeks pregnant for a second time is believing that you are an expert in childbirth one minute — after all, you have done this before — and next wondering why you didn’t take a refresher course because you don’t remember a thing that matters. Being 39 weeks pregnant is about being confused by your body’s signals. You feel steady contractions and think that maybe it’s the time to start timing them. Then nothing. Being 39 weeks pregnant is about becoming a public conversation piece. Earlier in pregnancy, you may have received warm and knowing smiles, an opened door, and a pregnancy-related comment here and there from strangers. Now, you cannot leave the house without continuous commentary from nearly everyone you encounter, from the preschool parent that you’ve never spoken to before who tells you that you’ve definitely “dropped” to the elderly ladies at the coffee shop who ask to feel your baby to see if you’re having a contraction, to the librarian who asks if you’re past your due date yet because she thinks you look like you are. Being 39 weeks pregnant is about panicked Amazon orders. Until the last few weeks, I have managed to avoid the sort of useless, anxiety-induced buying frenzies that characterized my first pregnancy — during which I bought three baby carriers, about ten types of baby bassinet sheets, five different styles of swaddle blankets, five different types of bottle systems, and assorted styles of onesies (kimono-style, snap-neck, no snap, long sleeve, short sleeve) “just in case.” But now I’m realizing that I do in fact need some things: diapers, wipes, baby soap, a rug for the baby’s room, a sound machine, etc. Being 39 weeks pregnant is about being sick of baby name lists, despite the fact that it has been your dream to name a girl since you were a small child. You wonder if there is any name that you and your husband can agree upon. And if there isn’t, you secretly think that you should get to name the baby because you are the one who is carrying around nearly 40 pounds of extra weight and hasn’t been able to see her toes since the Fourth of July. Being 39 weeks pregnant is about giving up any control over your moods. 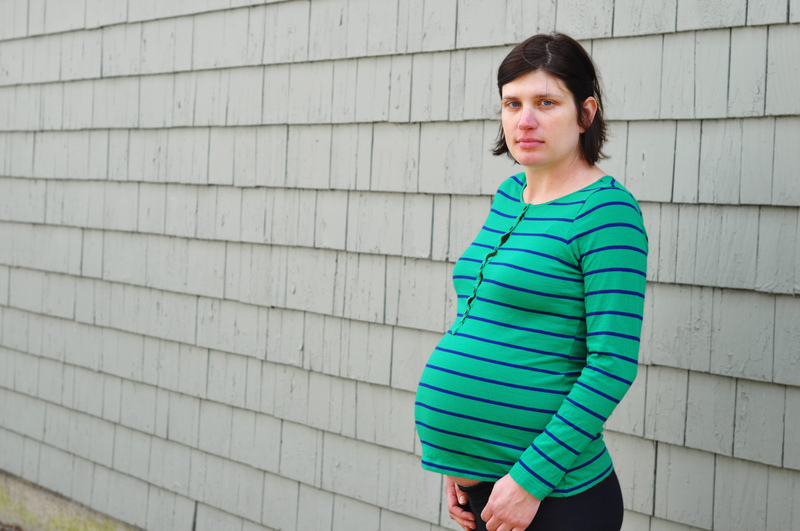 At the beginning of pregnancy, I was irritable and often downright nasty. Constant morning sickness for weeks on end will do that to a person. For the most part, during the rest of pregnancy, I didn’t feel all that much snippier or unreasonable than usual. (My husband may dispute this.) But now my moods are less stable than a toddler without an afternoon nap. Any given hour can bring giddy excitement, crushing disappointment, frantic anxiety, and unfocused annoyance. Being 39 weeks pregnant is about knowing that you are about to meet one of the most important people in your life. She’s in many ways a stranger, but also more a part of you than anyone you know. You will be a new mother, even if you have other children at home. You know that you will give your heart and all your love to this new person. But before you can meet, you both have the last part of this long journey to make. What was the end of pregnancy like for you? This is just perfect Jessica! I only made it to 38 weeks with both of our girls and my youngest is 8, so this time of life feels so far way- until, I read your post. I can remember all of these feelings so well after reading your words. Thank you for sharing all of this. It was awesome! Stacey recently posted…Could Recess Cure Our ADHD Epidemic? This was such a vivid description of 39 that it brought back so much for me. I’ve started my blog shortly after giving birth to my second son, so I’ve never blogged while pregnant, but somehow I completely understand the feeling you describe. I selfishly hope that this sense of protection over the private and the need to withdraw inward will lift once your little girl is here, because I can’t wait to find out about it in your own very unique voice. I pulled this up this morning, read it and ran out for an appointment – by the time I got back, you’d had your baby girl. And now you are officially in love and all of this is fading:). Congratulations! It was a lot like this, especially the last time when I was 35 as compared to 27 the first time. Quite a different stage of life. I was so glad to read your words here. You’ve had an amazingly productive year, but yes, it’s nice to come “home” sometimes to your original internet space. Mazel tov again on welcoming Eliza to the family! I wish you luck during these last days, or perhaps weeks (!) and I can’t wait to hear her name. I. Can relate because right now I’m 39 weeks and 5 days. Great article! Oh, this is lovely. This is my first time on your blog, but I’m at 39 weeks and almost 39 yrs and giggling all the way through this. Thank you for qualifying my crazy. I’m e-hugging you right now. My wife is 39 weeks pregnant now. I’m sure your baby is now healthy.